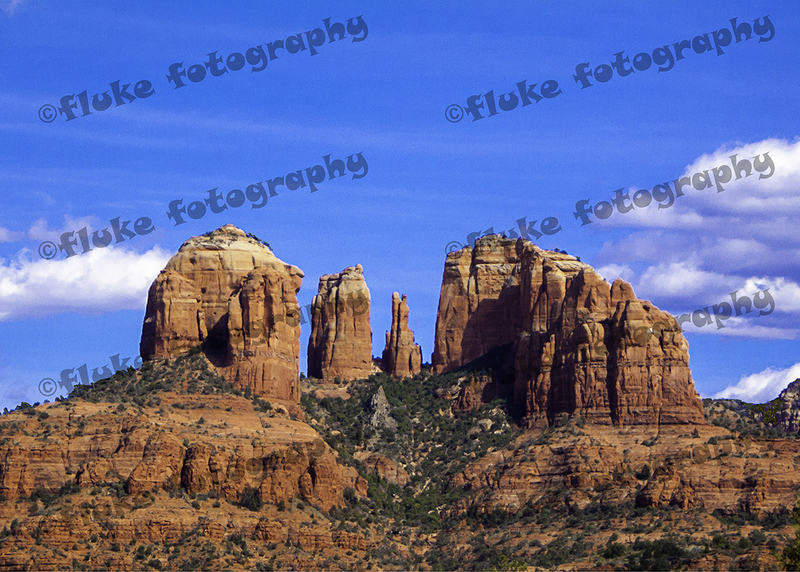 Cathedral Rock in Sedona, Arizona – One of the most iconic rock formations in all of the United States. The State of Arizona has graciously accepted this work to be displayed and offered for sale at its McGuireville rest areas just north of Phoenix on Interstate 17. I want to make this image available to all of those people that are just awed by Arizona’s red rock country, in particular, Sedona. Cathedral Rock, AZ – One of the most beautiful and magical places in the world. This image will be available in a large variety of sizes and media. Other than the Limited Editions, if you have a preference for a size that is not shown here, please contact me and let me know what it is you desire. I will do whatever is possible to accommodate your wishes. The Limited Edition Prints of Red Rocks & Blue Sky are 20” x 11.37”. In order to maintain the integrity of the Limited Edition Prints, no Gallery Wrap or Signed Print will be offered for sale in the same size , +/- 2”, of the Limited Edition Print. We feel this makes the Limited Edition Print truly a limited edition. All of the photographs are printed on Epson Ultra Glossy Photo Paper with Epson Ultra-Chrome HDX archival inks. Under most circumstances, the print permanance is expected to last 180 years. It comes in a black, textured linen weave heavy paper frame with deckled edges. Prices include the photograph and the black, textured linen weave heavy paper frame. Postage and handling will be determined upon receipt of order and then confirmed with buyer before processing. 5” x 7” – $12. Due to sizing restraints, the original image must be cropped to fit into the 5” x 7” format. Please click here to see how the image will look after it has been cropped to fit this size. 8” x 10” – $18. Due to sizing restraints, the original image must be cropped to fit into the 8” x 10” format. Please click here to see how the image will look after it has been cropped to fit this size. 8 1/2” x 11” – $25. Due to sizing restraints, the original image must be cropped to fit into the 8 1/2” x 11” format. Please click here to see how the image will look after it has been cropped to fit this size. 20” x 20” – $500 – The largest actual image size of this Signed Print is approximately 18″ x 10.2” It is centered and mounted on a 20″ x 20″ mat board. A minimum 2″ border surrounds each image. Allow 1″ in size discrepancy due to rounding. If exact size is a concern, please contact me before you order. 30” x 30” – $750 – The smallest actual image size of this Signed Print is approximately 22″ x 12.5” It is centered and mounted on a 30″ x 30″ mat board. A minimum 2″ border surrounds each image. Allow 1″ in size discrepancy due to rounding. If exact size is a concern, please contact me before you order. The initial price for this fine art print $1,000. The price increases to $1,250 after five Limited Edition Prints have been sold. The price increases to $1,500 after ten limited editions are sold. After 15 Limited Edition Prints have been sold, the price increases to $2,000 and increases by 10% for every Limited Edition Print sold after the sale of number 16. The print will be matted with the same white Petersboro 4-ply archival mounting board to which your print has been mounted. The matting will have a black core and extend approximately 2″ around the entire print. The mounted and matted print will be framed with a hand made and hand painted flat black lacquer wooden frame that is 7/8″ wide and 1″ deep. The print will be framed behind ClearVue museum glass that is UV rated. The frame will come with a sturdy mounting wire attached approximately 4″ below the top of the frame. Please reach out to me below for exact pricing for the image size you have selected. California Sales Tax will be collected on all applicable sales. If you have any questions at all, please contact me so we can discuss exactly what you have in mind.